Sneak Peek Sunday … Will she or won’t she? Welcome to Sara Walter Ellwood’s Sneak Peek Sunday! What have you been up to during these dog days of summer? In a race to find Excalibur . . .
Who knew they’d find love? Today, I’m taking a break from edits to offer one last peek from SEARCH FOR CAMELOT, a romantic comedy about a wisecracking American college student and a cool-mannered British bluestocking who find love when they join together to search for the fabled sword Excalibur. Philadelphia, London, Glastonbury. June 1892. On the eve of his college graduation, Arthur Pierce comes into an unusual inheritance, a 16th century parchment that contains a clue to the location of King Arthur’s sword. Is it for real? Or a hoax? To find out, Arthur joins with his arch nemesis from the classroom, the scholarly Chelsea Delafield. It’s Chelsea who holds the key to deciphering the ancient clue and following its trail, which begins in her home town of London. In previous peeks, Chelsea and Arthur posed as bickering newlyweds aboard a steamship to London, where they confirmed that, not only is the parchment authentic, but King Arthur too is more than legend. He was a mysterious fifth century military leader who once walked the earth in a place called Glastonbury. In today’s peek, Arthur is leaving for Glastonbury, but Chelsea’s role is done. London is her home, and now that she’s finished college, her loving but conservative family has perfectly reasonable expectations for her to meet. Those expectations don’t include running off with a handsome, totally unsuitable American on a madcap treasure hunt. Chelsea can’t risk ruining her reputation and scandalizing her dear parents just for the sake of one last fling at adventure, love and passion… Can she? Arthur didn’t answer her. Instead, he studied her face, and Chelsea suddenly felt as transparent as window glass. “Chelsea,” he began, taking a deep breath. Chelsea’s heart thumped. All it would take was one word from her. Yes. Her feet almost moved. Almost. Her heels rose off the ground for one indecisive second. Yes! a voice urged in her mind. But she couldn’t. “I can’t,” she said numbly. What do you think? Has this crazy magical quest come to an end for Chelsea? Is it time for her to grow up and forget childish dreams of adventure and romance? SEARCH FOR CAMELOT is available at ITUNES, AMAZON, and SMASH WORDS. Posted in Blog Hops, Books, Search for Camelot, Sneak Peek Sunday - 6-Paragraph Excerpts! 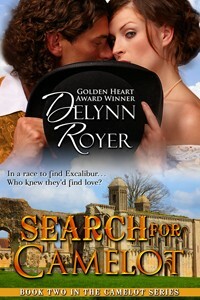 | Tagged Camelot, Delynn Royer, Excalibur, Glastonbury, light historical romance, romantic comedy, Sneak Peek Sunday - 6-Paragraph Excerpts! I sure as heck hope not! Go with him, Chelsea. Go with him!!! Great stuff, Delynn. As per your usual. 🙂 This one looks like so much fun! Thanks for stopping in to take a peek, Ava!